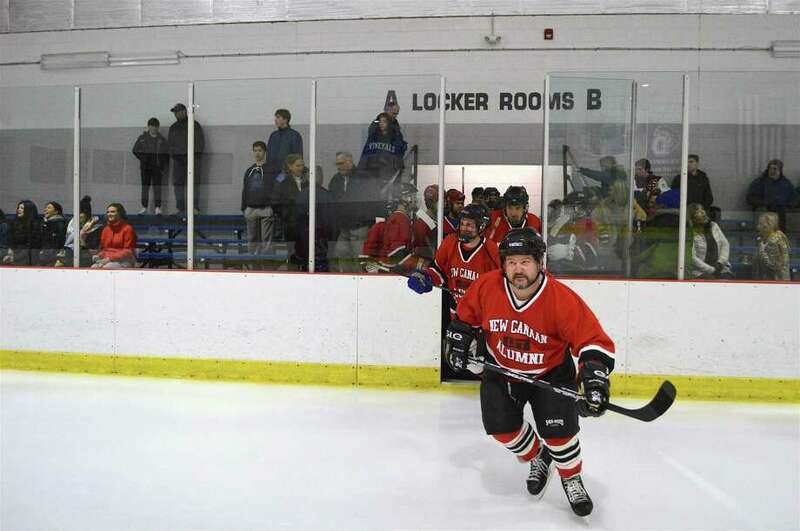 Tim Ring, the oldest alum present, from the class of 1986 and currently of Chicago, takes to the ice at the 39th annual Alumni Game for New Canaan High School’s ice hockey teams on Friday, Nov. 23 at the Darien Ice House in Darien. Below left, goalie Britt Gardella, class of 2012, watches her teammates in action. NEW CANAAN — Bonds of friendship and warmth met the chill of Darien Ice House last Friday evening when the current Ram hockey teams from New Canaan High School played their 39th annual alumni games against teams of graduates. “I think everyone would agree this is the best team they’ve ever been on,” said Britt Gardella, class of 2012, who was among 26 women competing against the current squad of girls. The current boys team even met one competitor from the graduating class of 1986 — Tim Ring — who came from Chicago for the game. “High school goes by fast, but you get to play for the rest of your life,” Hill said.